In a society where artificial agents such as personal assistants or domestic robots are very common, artificial and human actors have to show consideration for each other. Artificial agents have to learn culturally specific, socially appropriate manners. That way, human actors are not the only ones showing consideration and technological process logic influences socio-technical behaviour. These manners may be flexible in terms of time and space; however, they then become behavioural cultural techniques in order to be more effective in specific situations. Cultural techniques, societal norms and conventions regulate the social adequacy of interventions in socially shared situations. For example, they determine the appropriate time for apologies, greetings, good wishes, reproaches or other social practices and rituals. Assistant systems are playing an increasingly prominent role in everyday situations. If human actors do not want to entirely submit to the fact that the intervening assistants impudently demand immediate attention, assistant systems have to learn social manners. Then, cultural techniques become an essential aspect of artificial intelligence (AI) and research regarding assistance systems today. In many contexts, socially appropriate behaviour can be considered polite, hence the name „poliTE (polite technology) – social adequacy for assistance systems“. Designing these culturally sensitive, „polite“ assistance systems is an extremely complicated task that can only be accomplished with the help of initial research, research funding and networks of expertise. That way, our cultural techniques influence the systems’ design. In turn, successfully living with polite assistance systems influences how these hybrid communities behave. For example, are we the ones collaborating with robots? Should humans and robots shake hands? Culture, technology and cultural techniques are constantly interacting in a complex, highly effective manner. We understand cultural techniques to be goal-oriented, physical processes (techniques) that deal with symbols. For instance, bowing, shaking hands or smiling are physical routines that manifest and symbolically communicate something abstract such as social recognition or friendliness (Maye 2010; Krämer 2004). These processes are essential to successful social interaction. However, before engineers can design socially sensitive agents, the humanities have to investigate a number of different factors: What cultural techniques in terms of behaviour, interaction, cooperation and communication do we expect and master? What scope do we consider socially acceptable? What individual factors influence how we rate social adequacy? This can only be investigated for specific contexts of action, which is why the challenge of „polite assistance systems“ can only be tackled on an interdisciplinary scale. Assistance systems are playing an increasingly important role in our everyday lives: Personal assistants capable of learning, AI agents that run on smartphones (Siri, Cortana), on assistants such as Echo (Amazon 2016) and Jibo (Jibo 2016), or so-called social robots such as Pepper (Aldebaran Robots 2016) are on the cusp of becoming an everyday phenomenon in society as is already the case with mobile phones. At the same time, these new technological systems are assigned more roles than just that of an assistant; butler, coach, friend, companion (Böhle und Bopp 2014), protector or guardian angel (GA Project 2012), playmate, training partner, compassionate listener (Schroder et al. 2009), social or intimate partner, just to name a few. All these systems influence the way and the context in which we act. In the future, if our everyday life is going to be penetrated by intelligent assistance technology, making this future „human“ is going to be a question of technological manners. A technological assistant requires information on the current situation and has to be able to evaluate when and in what way interrupting a process would be appropriate. Whether it finds the right moment, tone, and mode all depends on evaluating the situation correctly. How can we teach these manners to artificial assistants? After all, when it comes to being aware of those manners, there are enormous differences between individual people. In any case, the existing modes normal, silent and airplane mode are not going to be sufficient for future assistance systems. We are going to need more nuanced modes – but what exactly are they going to look like? At a formal event, at work amongst colleagues, at work with (international) clients, with family, with a partner, with friends, with good friends, with old friends, with acquaintances, etc? For each of those modes, what are the requirements in terms of intervention, channel, timing, etc? For example, should household robots shake hands with us and if so, when there is a group of guests, who do they shake hands with first? In what order do we shake hands when meeting a group of people: someone we know or the most important person first, ladies first or just one person after another? Are we and is a robot allowed to refuse to shake hands with someone? Is an autonomous car allowed to act against traffic regulations and let a hesitant cyclist pass instead of putting them in a critical situation that would technically be in accordance with the rules? Answering these types of questions is extremely relevant to the success of human-technology-interaction, but there are also a number of prerequisites. Teaching manners, cultural techniques, or the ability to assess and consider social adequacy to future assistance systems or letting them acquire these skills is going to be an important step towards creating a hybrid society that consists of both people and technological agents interacting in complex contexts (Gransche et al. 2014) and that is still „human“. poliTE aims to analyse the ground- and framework for a new generation of „polite“ assistance systems on an interdisciplinary level and to create a network within the research community. Our affiliated partners working in the fields of philosophy, ethics, and psychology are looking into social adequacy, cultural techniques related to behaviour, and technology design of and research on advanced assistance systems. They are then discussing their results with relevant key players in their respective fields. With regard to social adequacy in human-human-interactions, we are working on and synthesising a comprehensive, socio-psychological, and philosophical overview, which we are then restructuring for human-technology-interactions (HTI) within the scope of what is adaptable. 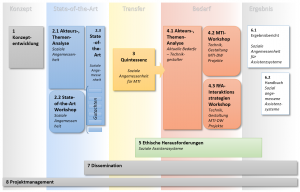 We are working with German HTI designers in order to identify the current demand for socially adaptive systems and to find potential solutions and additional prerequisites in research and funding. poliTE is connecting the humanities to social robotics and assistance system design to raise awareness for social adequacy in HTI among different players. In doing so, we aim to encourage interdisciplinary follow-up projects in HTI on the effect and acceptance of „polite“ assistance systems. In the long term, poliTE’s objective is to inspire research that develops culturally adaptive, socially adequate assistance systems to pave the way for „polite“ forms of HTI. Apart from this, poliTE aims to create a link between two research communities (the humanities and technology design) as well as raising their awareness for phenomena of social adequacy and hybrid behaviour. The goal is to enable interdisciplinary HTI follow-up projects that investigate social importance for example, how the targeted design of polite assistance systems influences their performance and adaptability in everyday life. Another long-term goal is to encourage research that can design culturally adaptive, socially adequate assistance systems that work adequately in intercultural settings and lead to more „human“ interactions in the future. Analysis of players and topics with regard to: socially adequate behaviour and behaviour-specific cultural techniques in general and between people (focussing on adaptability in terms of HTI). Analysis of players and topics with regard to: advanced assistance systems, technology design of state-of-the-art/prototypical HTI configurations (e.g. virtual agents, social robots) that are on the cusp of implementing socially adequate behaviour. Adjusting the analysis of cultural techniques so that it can be applied in specific HTI research and design. Distributing the results for further scientific and public discussion. Our aim is to strengthen the approach of „making technology more accessible“. PhD projects: within the framework of this project, we are able to supervise three PhD dissertations in social psychology, philosophy, and cultural studies. Main focus on HTI research: poliTE is taking on an interdisciplinary range of tasks that need to be tackled in many experimental projects but often do not receive the sufficient amount of resources. In doing so, we are putting the focus on the human side of HTI and paving the way for technologies with social skills (e.g. assistance systems, social robots, etc.). Enabling more research: empirical research on social importance dynamics in HTI, for example, can build on poliTE’s results. Community building: we are identifying and creating a network of researchers from fields such as social behaviour/behavioural cultural techniques on the one hand and research on systems that are aware of social/cultural/emotional implications. Definition of the phenomenon of interest; concept design of approach, method, and time/event schedule. Work package 2 aims to provide an overview of the interdisciplinary research on social adequacy, behavioural cultural techniques, and on the key aspects of impressions and social judgements from a socio-psychological point of view. The guiding question is: who judges what behaviour to be socially adequate at what point in time and in which cultural techniques does this implicit knowledge manifest itself? In order to answer this question, we analyse topics and players, hold an expert workshop, and obtain expert opinions to acquire more in-depth knowledge. Work package 3 acts as an important link: all of the results gathered in WP2 are evaluated, summarised and restructured according to its adaptability to human-technology-interactions. While WP2 is about research and painting a complete picture, WP3 aims to adjust this picture to the possible needs of technology designers to create a bridge to the workshops held in WP4. 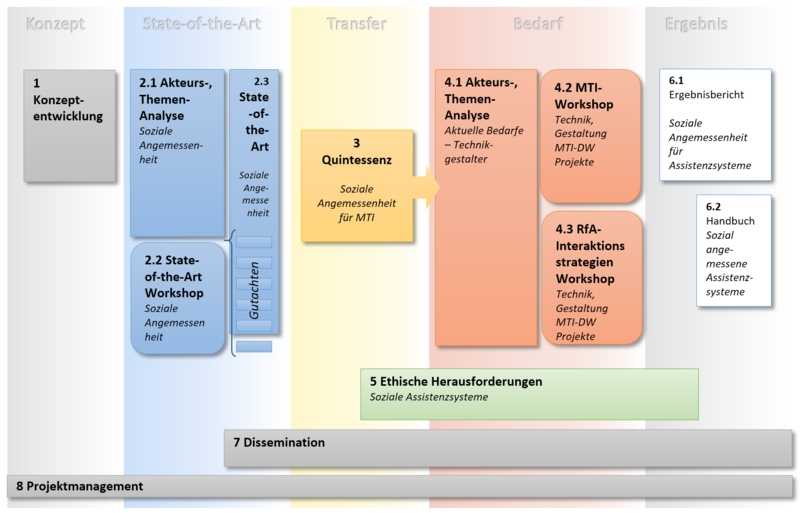 The objectives and method of work package 4 are similar to WP2, however, the subject matter is different: the aim is to discuss current research on the next generation of prototypical, social, and intervening assistance systems. Here, the focus lies on the challenges of socially adequate interactions. The guiding questions are: which assistance systems are on the cusp of advanced social interaction? Who researches/designs them? To what extent are social adequacy/behavioural cultural techniques taking into consideration? For this, we look into players and topics and identify respective key players, who are then invited to take part in this work package’s two workshops on „Advanced Assistance Systems“ and „Robots acting as assistants: interaction strategies“. The approach that social adequacy and behavioural cultural techniques can be investigated and made accessible for the design of human-technology-interactions is based on fundamental hypotheses with many prerequisites, which could lead to important lines being crossed. This is why, in work package 5, we carry out two critical ethical analyses of the other work packages. First, the analysis „Social Adequacy“ addresses the question of what the norms in social adequacy and behavioural cultural techniques are. This is a critical approach to find out to what extent current social adequacy can become an imperative, that becomes consistent through decisions in system design. Second, the analysis „Polite Technology“ examines to what extent current opinions, design approaches, metaphors, but also poliTE’s central hypotheses may lead to a problematic understanding of technology, for example, anthropomorphising intervening systems. The first objective of WP6 is a comprehensive final report on the project’s work and results. The second objective is a manual on „Socially adequate assistance systems“, that is specifically meant as a quick guide when focussing on design. It aims to help current and future projects on advanced assistance systems take poliTE’s main focus into account when designing and investigating future systems and research projects. Addressing research communities and the public through publications, presentations, the poliTE website, etc.